EdmontonRealEstate.pro is one of the most popular real estate web sites in the Greater Edmonton Area. With over 2.5 million page views per month, it's a great place to advertise your home for sale. 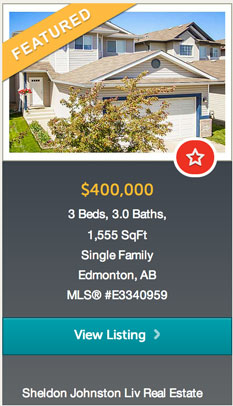 All condo and single family homes actively listed on the Edmonton MLS® system are shown on this web site. In addition, all Liv Real Estate® listings are featured on EdmontonRealEstate.pro. Featured listings are shown at the top of the search results with a "featured" banner. To feature your home on EdmontonRealEstate.pro, contact Liv Real Estate® today!